This entry was posted on April 21, 2015 at 3:37 pm and is filed under Teaching Mathematics. You can subscribe via RSS 2.0 feed to this post's comments. 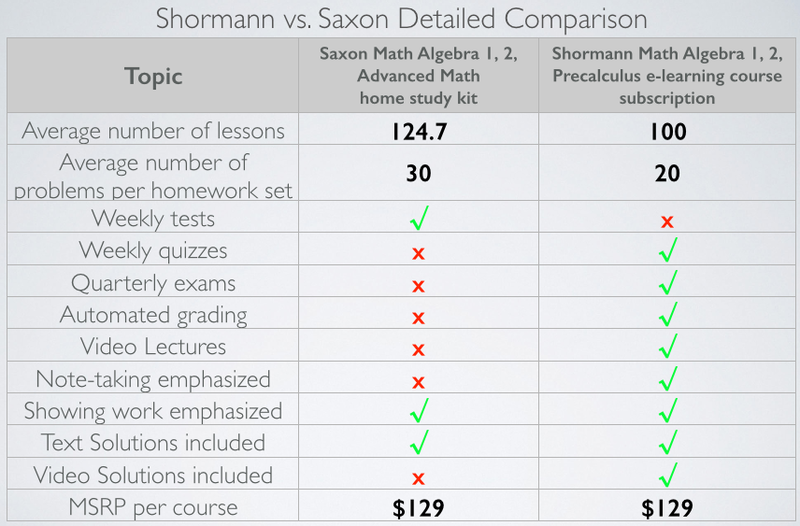 I’m very interested, but my daughter is working on Saxon Algebra 1 this year. I am guessing I would not be able to change to Shormann for next year because she would have missed the Geometry aspect of Shormann Algebra 1, is that correct? As a follow-up – if she did Saxon Geometry (or some other Geometry) next year, I would guess she really couldn’t do Shormann Algebra 2 the following year because she would have done so much Geometry already and there would be a lot of review in Shormann Algebra 2, correct? (although review is probably great for her as she is not a strong math student at all). That’s a good question! 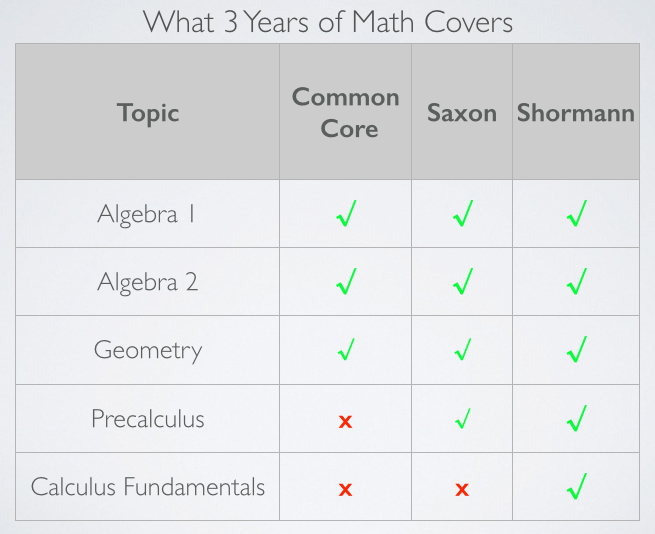 The first 25 lessons (first quarter) of each Shormann Math course are a review plus introduction to the foundational concepts that will be covered in that course. I’m assuming not everyone will have completed Shormann Algebra 1, so in Algebra 2 there will be appropriate geometry review, including links to key lessons from the Algebra 1 course for students who need extra review and practice. And because Shormann Math is integrated, students will still be covering a lot of geometry in the precalculus course. 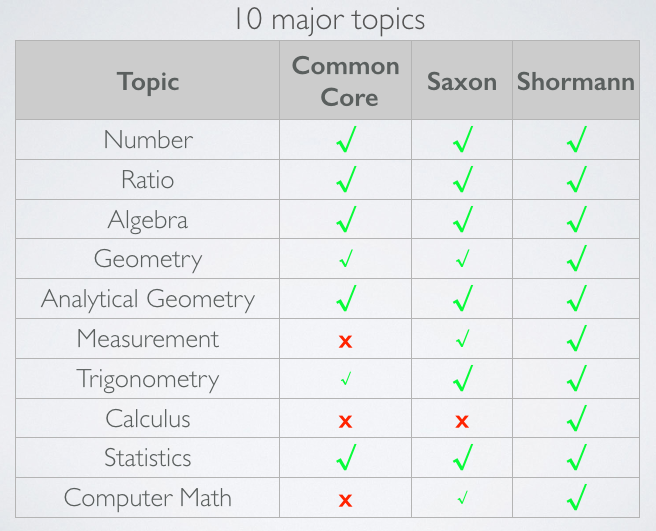 If you switch to Shormann Math for Algebra 2, what you’ll want to be looking for is mastery of the concepts (and I can help you assess that if you want). If you feel that your daughter has mastered all the geometry concepts, then give her a geometry credit at the end of Shormann Algebra 2. Otherwise, wait until she is halfway through the Precalculus course, after which time she will have had more than enough geometry. Regarding Saxon Geometry, we only recommend that book for students who did a “layer cake” algebra 1 and 2 with another curriculum besides Shormann or Saxon, and therefore have had no geometry at all. I definitely think she should do Shormann Math instead, as the Saxon Geometry has a lot of extra “fluff” in it, and is also missing some very basic things, like who Euclid was and the importance of what he did (they have 1 sentence on him in a 904 page book!). I hope that answers your questions! Will Shormann Math have a physical textbook at all? Or is the entire course computer-based? Right now, it won’t have a textbook, although the Reading Assignments are basically a pdf version of the textbook. One of the main reasons we don’t have a textbook is because math is best learned by an active, pencil and paper approach, where note-taking and showing work on homework are essential. The main times the student refers to the reading assignment is to read over any new rules or definitions prior to watching a lecture, and then later if they need to review a concept. Thanks so much! So the problems they work out are on the computer screen only? How does the automated grading work when it comes to showing their work on the problems? The best way to think about it is that they ANSWER their questions on the e-learning campus. They SOLVE their problems using pencil and paper. There are two ways to keep up with the student’s handwritten work, 1) parent/teacher does this and assigns a completion grade for this work, or 2) enroll them in our live online class, and I will keep up with it. Oh! I thought of another question…will you continue to support DIVE with Saxon? Or will you be transitioning over to only support Shormann Math? We’ll definitely continue supporting DIVE/Saxon. I am interested in this for our son. He is 15 and in 9th grade. He has done Teaching Textbooks since 5th grade and is doing their Algebra 1 now. Would it be alright for him to do your Algebra 1 next year? Yes, he could actually start Shormann Algebra 1 now. 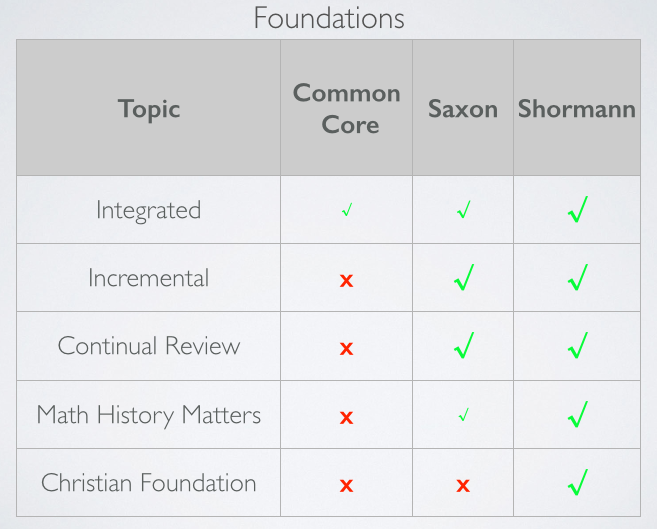 The way the course is designed, we assume people will join from non-Saxon curricula, and therefore probably haven’t covered as big a variety of topics as Saxon students have. The entire first quarter (25 lessons) introduces all the major concepts covered in the rest of the course. For a Teaching Textbooks student, I would say probably 50%+ of the first quarter is going to be review. And, if he’s already doing TT Algebra 1, some of the Shormann Alg. 1 lessons past Lesson 25 will also be review. I hope that helps answer your question!